It started out like any other potluck. I made chili, but the Crock-pot was only half full, so I added cooked macaroni and corn and ripe olives and green peppers until the Crock-pot was full. I found if it was only half full it burned around the edges. Besides, you don’t go to a potluck with a half full Crock-pot. Back to the “3 in 1 Slow Cooker” – it was hard enough controlling my envy the year she received it; but it got worse each year because it came to every family dinner after that. She always had the right size bowl for whatever she wanted to bring – usually “Little Smokies” wrapped in bacon. At the beginning of the summer I started making many meals in the Crock-pot instead of heating up the house. I decided I was going to buy myself a “3 in 1 Slow Cooker” and justify it by the savings on the air conditioner. I just couldn’t bring myself to do it. So I wrote down the measurements of the two Crock-pots I already own. One was 4 quart and the other was a 1 quart. All I needed was a 2 quart Crock-pot for the recipes that were smaller in volume. I went online and found one for $10.00. That was much easier for me to spend than the $50.00 to $70.00 on the “3 in 1 Slow Cooker”. I used all three Crock-pots for one family dinner in July. We had three hot dishes and the house did not get heated up. The moral of this story is to look at what you already have and buy only what you need. As for my sister-in-law – I give up, she will always be more trendy than me! 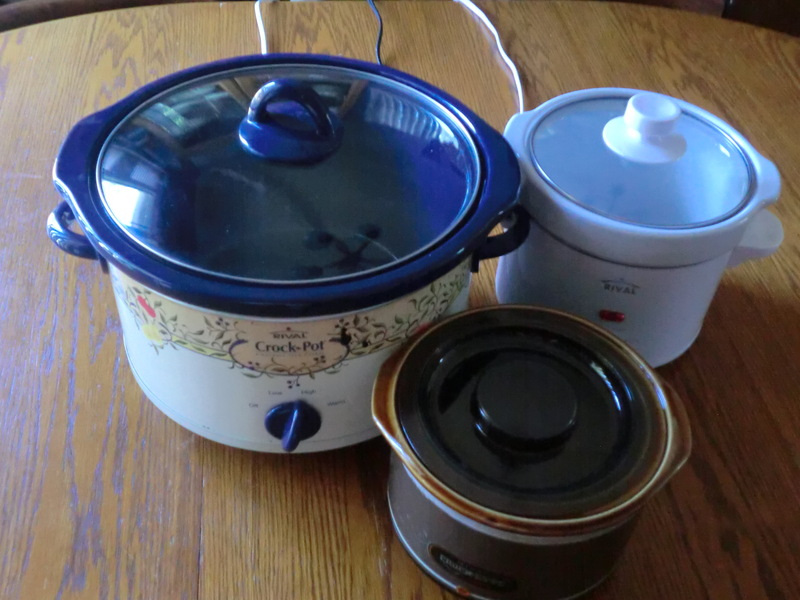 These are my three Crock-pots! This entry was posted in Food, Money Saving Ideas, Purchasing, Use What You Have and tagged Food, Money Saving Ideas, Purchasing, Use What You Have by Frugal Fish. Bookmark the permalink. Yes chuckling here as we have 3 as well! Not using a stove so we love our crock-pots especially when it is hot and since I do not cook …….he can work late and we still eat :D . Have had to re-invent frugal for ourselves last couple of years so I am here visiting. Luckily, frugal times do not last forever! They do come and go, though. I thought I was the only one who did not use her stove. It is closed from April to October.